While coloring never goes out of style for kids, it’s now a booming business for adults as well. Sales in adult coloring books soared from 1 million in 2014 to a whopping 12 million in 2015, and colored pencil sales jumped 26 percent that same year. With Crayola releasing premium coloring kits designed for adults, it’s looking like adult coloring is here to stay. And for good reason: Coloring is not only fun—it may help you stay healthy. “Coloring appears to be universal – a valuable tool for individuals of all ages,” says Andrea Smith, PhD, a psychologist at Medical City Green Oaks Hospital in Dallas, Texas. According to Smith, coloring has the power to ease your mind and boost your mood. Here are four ways that coloring can brighten your life and improve your health. On most days, your brain ­and body are in high gear. 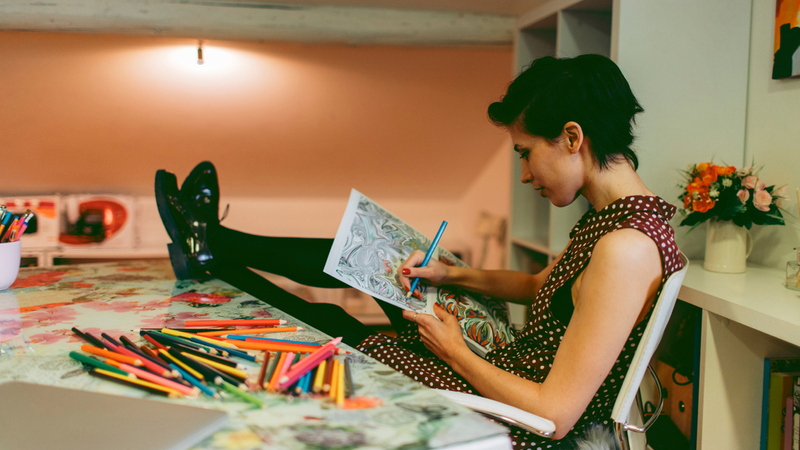 Whether you’re running from meeting to meeting or from soccer games to dance lessons, sitting down at some point in the day for even a brief coloring session can clear your mind of added stressors. “Often I’ll recommend coloring to patients as a part of their bedtime routine,” says Smith. Bonus: Making coloring part of your nighttime ritual means you’re shutting down electronics, and that can make for better sleep. Anxious? Get out the crayons. A study of 57 college students shows promising evidence that art therapies such as coloring, painting, drawing and clay modeling, even if done for short periods of time, may reduce anxiousness. And coloring might not only help with situational anxiety, but also with anxiety disorders. “Engaging in creative therapeutic tasks like coloring can induce relaxation that helps many people feel more in control of their anxiety,” says Smith. And while coloring might not be the “solution,” she says, it may be one piece of the puzzle, that, along with individual therapy, relaxation skills and medication, can help manage anxiety symptoms. If you have a hard time concentrating, taking a break to color may help you return to your task with fresh focus. “Coloring gives us the opportunity to home in on a simple activity that does not require much planning or strategy,” Smith says. Further, she says, coloring only requires the brain to work on one thing at a time, thus helping the mind to focus.